Your business card can tell a lot about you and your business. So why not make it a good one? Here we have a great choice of cards to suit any budget and timescale. the perfect card for you! 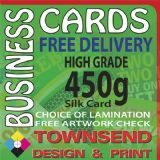 Simply order online, upload your artwork and receive your cards within a working week!